There are millions of homeless pets, so it’s a great idea to adopt your feline friend from an animal shelter or a rescue group. Pet stores and breeders can also be reputable sources, but anyone can call themselves a breeder and sell cats. Adopt from a shelter or a rescue group, and you get two feel-good bonuses: You save money -- and a life. As you cuddle kittens, you may be tempted to take home more than one. Many people who have more than one cat say that two cats give each other company and exercise. Do you have enough space? Time? Money? If the answer is yes, prepare for double the commitment -- and double the rewards! 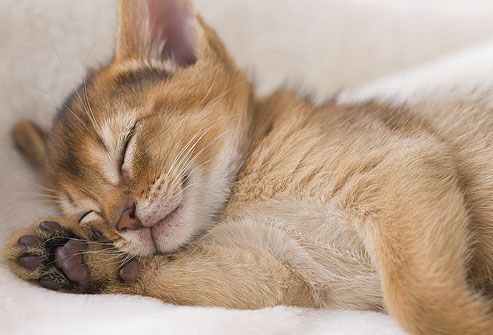 Before you bring home your kitten, make sure you have a litter box, cat carrier, kitten food, food and water bowls, a collar and tags, and toys to entertain your new pet. Cat-proof your house before kitty arrives. Put away cleaners, and pick up anything she could swallow. Many vets suggest keeping cats indoors because indoor-only cats usually live longer, healthier lives. If you choose to keep your kitten indoors, make sure he has window perches and toys. Do You Really Need Kitten Food? Until they’re 1 year old, kittens need up to three times the calories as adult cats. So look for food made especially for kittens and feed your kitten the amount recommended on the label. Talk to your vet about using canned food, dry kibbles, or a mixture of both. 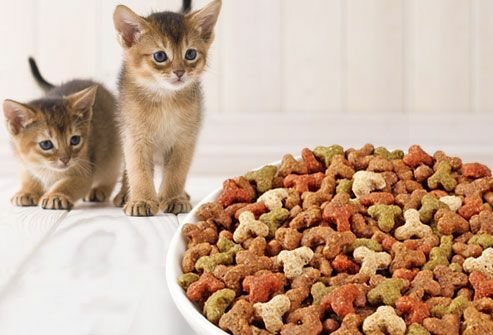 Be sure to put the food somewhere the dog can't get to, as kitty food can upset a dog's stomach and add unwanted pounds. Always have lots of cool, clean water for your kitten. Put several water bowls throughout the house, and keep them clean. If you notice your kitten isn’t drinking much, try a flatter dish that doesn’t surround her small face so much. 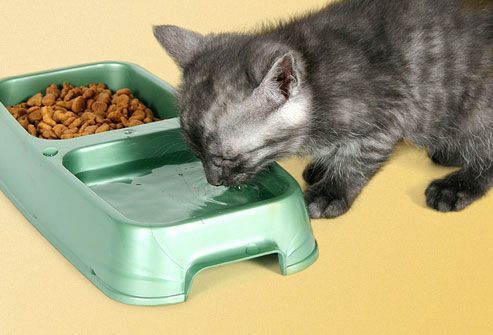 Some cats prefer moving water and may like a kitty water fountain rather than a regular bowl. 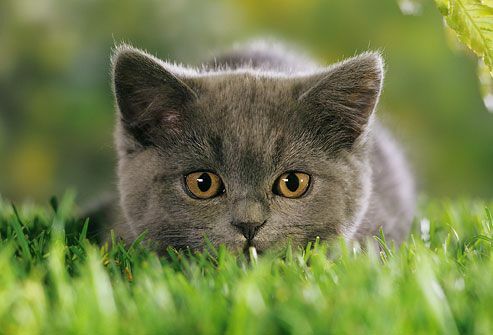 Cats have an instinct to poop in soil or sand, so your kitten will likely use a litter box right away. Put it in a quiet spot, and show her where it is. 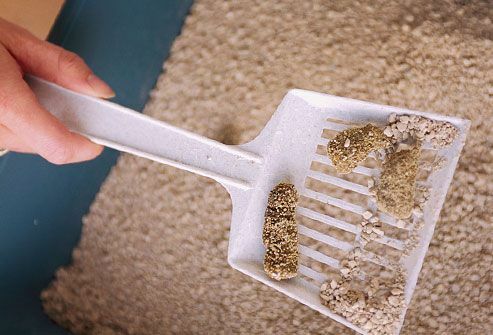 Kitty litter choices include regular and clumping clay litter, crystal litter, as well as litter made from wood chips, grains, and newspapers. Some cat boxes are too high for kittens to get in and out easily, so you may need to start with a low-sided box until your kitten grows. 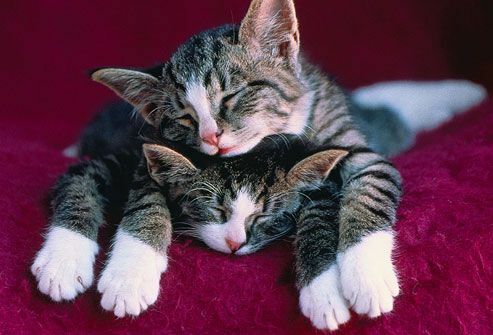 Cats sleep up to 16 hours a day, kittens even more. As much as you love cuddling with kitty, she’ll probably enjoy a spot all her own. She’ll happily curl up on a perch attached to a window ledge, a cat tree, a fuzzy pad on a chair, or in her very own snuggly cat bed. If you have a dog, it’s important to give your kitten a safe and private place to sleep. By gently playing with your kitten daily, you teach her the people skills she needs to be a good pet. 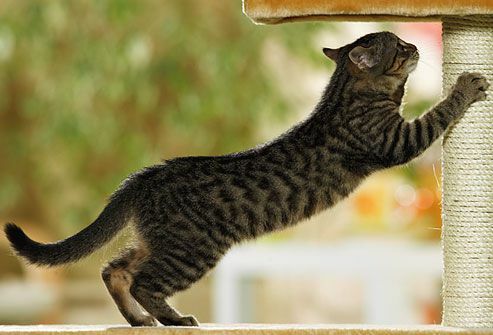 You also help her keep fit, develop coordination, and find an outlet for behaviors like chasing and pouncing. If kitty likes to use her teeth or claws, give her something to bite on or cling to as you play. Don't use your hand as a toy! If she thinks hands are toys, she might accidentally hurt someone. Cats often interact with the world through their mouth, and as cute as your kitten looks playing, not everything in your house is a good toy. Keep string, ribbon, yarn, rubber bands, plastic milk jug rings, paper clips, pins, dental floss, and other temptations away from your curious cat. Also, put away cleaning supplies, pills, and drugs, as well as antifreeze and motor oil. Your kitten is new to the world and your house, so she’ll need to learn the rules. To stop some behaviors, give her other outlets. For example, to keep kitty off the curtains, give her a sisal-covered pole to climb. Don’t want her clawing the couch? Put up scratching posts. To show her the posts are OK to use, pretend to sharpen your claws on them or sprinkle catnip on them. Secure the posts well, so your cat will feel safe using them. 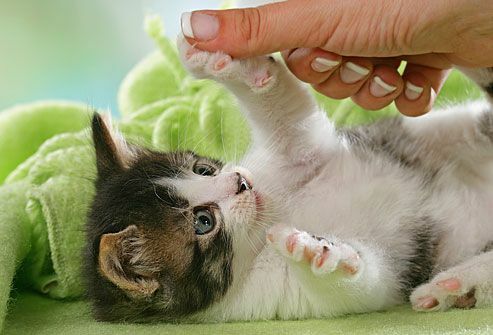 Declawing kittens and cats is controversial. Cat claws are attached to bone, and surgery removes the last joint of each "finger." People who are against declawing say it's inhumane. Those on the other side say it can make a cat a better pet and less likely to end up in a shelter. If you declaw your cat, surgery should be done before 6 months of age. Declawed cats should always be indoors because they have trouble defending themselves. 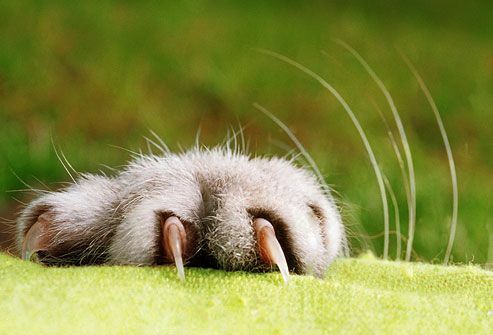 Try these tips for your kitty’s claws. 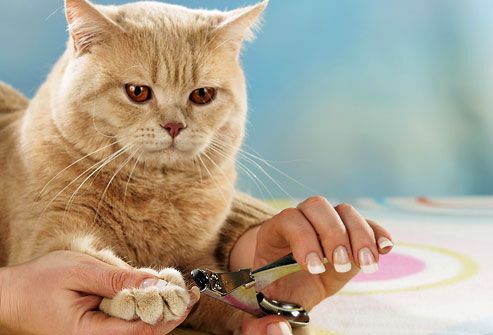 Nail clippers are easier to use than you think, and usually you only need to clip the front claws. Don't cut the central pink part, or "quick" -- the blood supply to the nail. Gently press the foot pads to extend the nail before clipping. Your vet can show you how. Scratching posts let cats do the work. Claw caps are tiny vinyl sleeves that fit over your cat’s claws, keeping them from doing damage. Drinks like alcohol, coffee, and tea are dangerous for your cat. 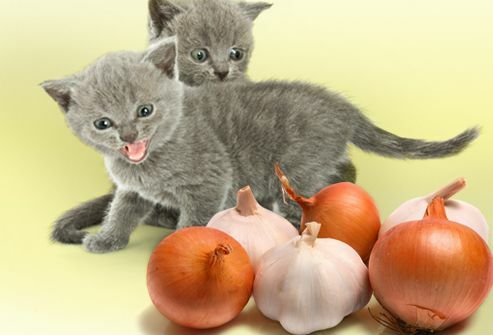 To help keep kitty safe, keep him away from onions and garlic, as these foods cause anemia in cats. 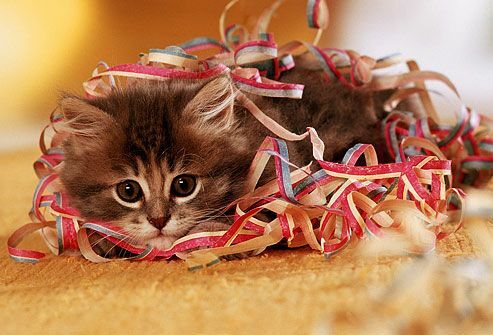 Offer your kitten his own goodies, like a pot of catnip or oat grass. Think your cat has eaten something dangerous? Call your vet right away, or call the Animal Poison Control Center at 888-426-4435. 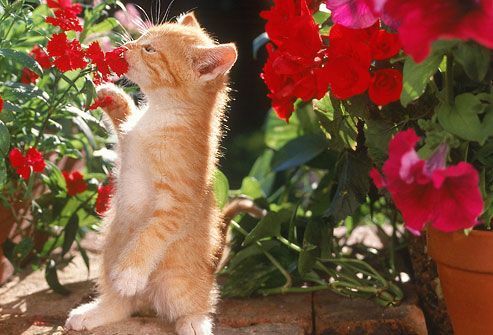 Several house or outdoor plants can be dangerous to your kitten, including chrysanthemum, azalea, tulip bulbs, and oleander. Lilies are particularly poisonous to cats, and even small amounts can make your kitten very sick. Not sure if a particular plant is kitty-safe? Talk to your vet. And if you think she’s eaten something poisonous, call your vet right away, or call the Animal Poison Control Center at 888-426-4435. With an estimated 6 million dogs and cats entering shelters every year, there are not enough loving families for all of them. 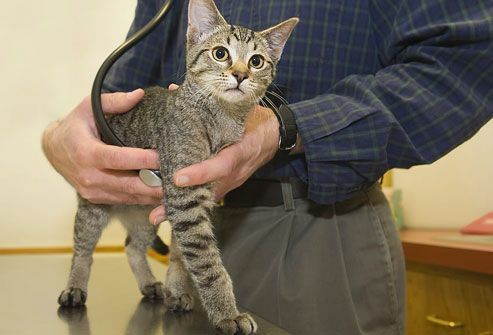 That’s why groups like the Humane Society and the American Veterinary Medical Association recommend spaying or neutering your cat, which can be done as early as 8 weeks old. Some groups can help with the cost of surgery. If you notice your kitten is losing hair, has irritated skin, is chewing and licking often, or is scratching a lot, he may have fleas. Ask your vet which flea control he recommends for kittens (some products also prevent heartworms), and then treat all the pets in the house. Some flea treatments used in dogs can be very toxic to cats, so always read the package carefully. 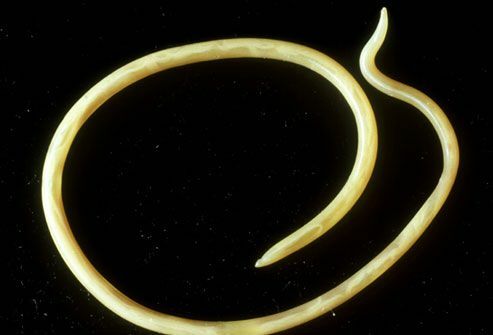 You can’t always avoid these parasites, but you can work with your vet to make catching them less likely. 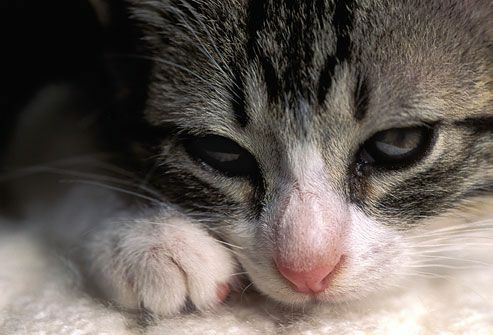 Roundworms (which cause diarrhea and vomiting), hookworms (which can cause anemia and diarrhea) and tapeworms are the most common ones your kitten will face. If you see what looks like rice grains or spaghetti in your kitten's stool or around her bottom, see your vet for medication. Many heartworm meds have monthly dewormers. 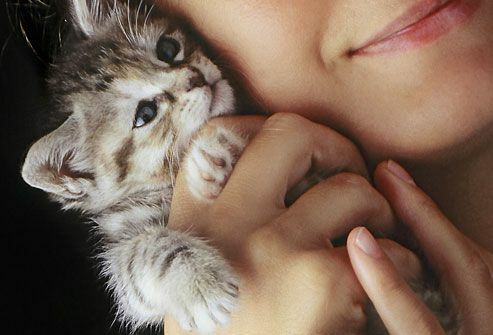 Your kitten’s vaccinations will help keep her healthy. 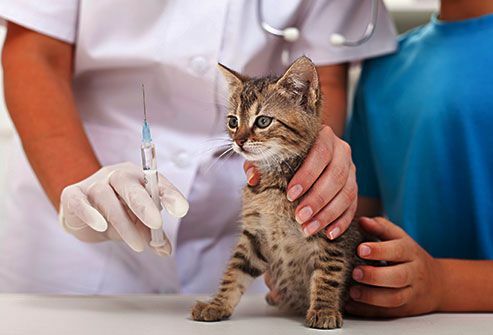 Vaccines can prevent common illnesses such as rabies, feline distemper, feline leukemia, and upper respiratory infections. 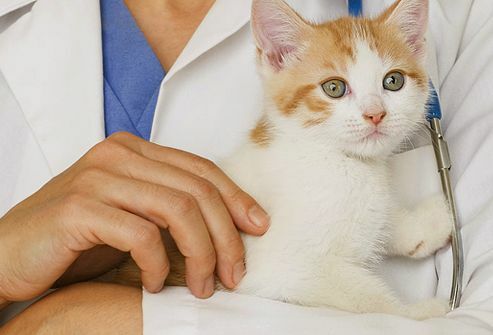 Talk to your vet to see which vaccines are right for your kitten. 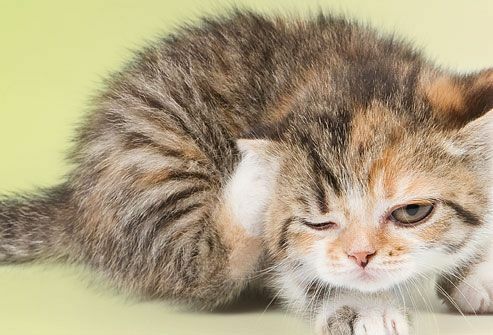 There are signs to look for that tell you your kitten may be sick, including refusing food or water, panting, sleeping much more than usual, hiding, coughing, sneezing, vomiting, or losing weight. If you think your kitten isn’t up to snuff, talk to your veterinarian. Never give your cat something from your own medicine cabinet. Some medicine can be deadly to cats. A good way to find a great vet is to ask people you trust for recommendations. Then, visit each clinic. Does the clinic look and smell clean and well-managed? Do the vets listen to you? Answer your questions clearly? Are the staff members calm and caring? Don’t be shy about changing clinics if necessary. Like all babies, kittens seem to grow up right before your eyes, and before you know it they’re braving the world on their own. 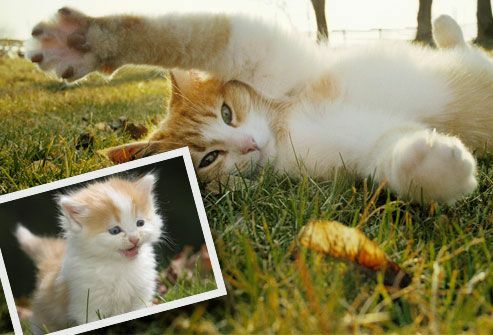 So be sure to take lots of pictures and enjoy every moment as your rough-and-tumble little kitten changes and grows into your cat companion. American Society for the Prevention of Cruelty to Animals: "17 Common Poisonous Plants," "People Foods to Avoid Feeding Your Pets," "Finding the Right Vet," "Cat Litter," "Fleas," Nutrition Tips for Kittens," "Spay-Neuter," "Safe Outdoor Environments," "Enriching Your Cat’s Life," "Keeping Your Cat off Countertops and Tables," "Are Two Cats Better Than One?" "Cat Toys." American Veterinary Medical Association: "What You Should Know About Selecting a Cat," "Backgrounder: Welfare implications of Declawing of Domestic Cats," "Declawing of Domestic Cats," "What You Should Know About Choosing A Veterinarian For Your Pet," "Vaccination FAQ," "What You Should Know About Household Hazards." "Before You Buy That Kitten, " Phil Maggitti. Barron’s, 1995. "Your Kitten: Choice & Care," Paddy Cutts. Howell Book House, 1989. 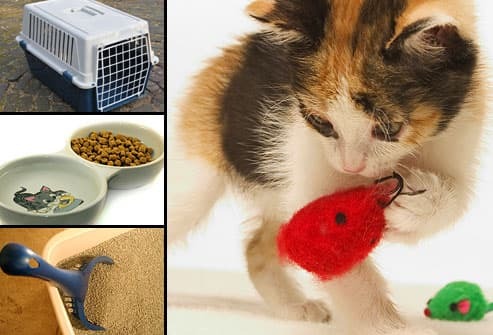 Cornell University College of Veterinary Medicine: "Ways to Cat-Proof Your Home." Hillsboro Veterinary Clinic: "Why Should I Neuter My Cat?" Peteducation.com: "Litter Box Training For Your Kitten: The Basics." The Humane Society of the United States: "How Pets Help People," "The Scoop on Adoption—Everything You Need To Know, " "Declawing Cats: More Than Just a Manicure, " "Choosing a Veterinarian, " "Preventing Common Feline Diseases, " "Foods Potentially Poisonous to Pets, " "Kitten Behavior Basics, " "Cat Toys: You Need Them, " "HSUS Pet Overpopulation Estimates. " The Merck/Merial Manual for Pet Health, Home Edition. The Pet Place: "The Feeding and Nutrition of Kittens," "Picking the Best Bed for Your Cat," "How to Tell If Your Cat Is Sick." VeterinaryPartner.com: "Roundworms: Cats & Kittens." Virginia-Maryland Regional College of Veterinary Medicine: "Nutrition for Growing Kittens."